We will help you meet lenders that provide the best VA rates available online for 30-year refinancing, new home purchase loans and the streamline rate. Get help shopping for discount interest rates for veterans seeking home-buying or refinance loans to ensure lower monthly payments with interest rate deductions. Veteran homeowners, who already have existing mortgages, may qualify for the popular VA streamline program. 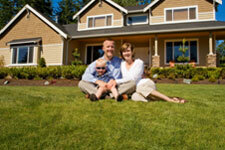 This is a refinance loan that cut their interest rate quickly with very little costs involved. Take advantage of our guaranteed best VA rates that have been reduced for military and veteran borrowers. The VA program offers low mortgage rates and aggressive lending criteria like 100% refinancing and no money down purchasing. We have helped thousands of military applicants become homeowners with our low VA interest rates. Complete the form below and you will find out what the best VA mortgage rates currently online! In some cases VA borrowers can lower their mortgage rate with no points and no fees being charged. Military home mortgages enable veterans to qualify for competitive interest rates even if they currently have low credit scores. The current VA mortgage rates are at record low levels, so recommend qualifying and locking in your home loan today to maximize the historic interest rates. The VA mortgage is very unique in the lending industry because there is no down-payment required, no monthly mortgage insurance and today's VA interest rates are competitive with any other type of loan. Current interest rates on VA home Loans have remained affordable for military housing. Do you need to lower your mortgage payment with a fixed rate and get access to cash out, but suffer from a bad credit scores? It is very common for Veterans to run into financial obstacles after leaving the service. Most veterans pay their credit card bills, car loans and mortgage payments in a timely manner, but sometimes unexpected expenses arise and force the borrower to be late on some of their debts. Unfortunately, when your credit card and loan payments fall behind more than thirty days, your credit score begins to plummet. In some cases, veterans were forced to refinance with a subprime loan that charged a higher adjustable interest rate and a significant pre-payment penalty. We can help veterans refinance out of their high rate ARM into a more affordable mortgage that guarantees a fixed rate for thirty years. Another benefit of work with our VA lenders is that we do not charge a pre-payment penalty for any type of VA home mortgage whether you are refinancing or buying a home for the first time. Talk to a lender at no cost and ask for more details on the home loan with no credit check. If everything sounds good, then you can move forward and complete a formal loan application that will consider your credit profile. The Veterans Administration uses Form 26-1880 which is called a certificate of eligibility. This form determines the eligibility for participation in the VA mortgage loan program. Complete a VA Form 26-1880, Request for a Certificate of Eligibility: You can apply for a Certificate of Eligibility by submitting a completed VA Form 26-1880, Request For A Certificate of Eligibility For Home Loan Benefits, to the Winston-Salem Eligibility Center, along with proof of military service. In some cases it may be possible for VA to establish eligibility without your proof of service. However, to avoid any possible delays, it's best to provide such evidence. How does my VA lender get my Certificate of Eligibility? Approved lenders can help you get your certificate of eligibility through the automated certificate of eligibility. Get quotes from VA mortgage lenders that provide competitive VA mortgages to our automated system. This web based system establishes eligibility while issuing a Certificate of Eligibility online. We recommend that if a veteran does not have their eligibility cert to request this from their VA lender about obtaining a certificate. What Will The Fed Decision Do to 30-Year VA Mortgage Rates? Federal Reserve System Chairman Ben Bernanke has lowered the rate the Federal Reserve System has established for banks to charge each other by half a point. How does this affect fixed interest rates for VA home loans? What does it mean for veterans refinancing their homes? What does it mean for government home loans? Unfortunately, the answer to all of these questions is, "Not very much." Will 100% home loans with no equity required still be available for veterans? Yes, but their interest rate will likely be higher than the rates available to those who are able to put 10 or 20 percent down on their homes. Certainly the interest rate cut gave hope to many people who follow the residential real-estate market and boosted consumer confidence. Credit card interest rates are likely to dip a bit, as will new car loans, but the cut doesn't seem to have been enough to have a significant impact on the credit crunch, partly because the federal-funds rate has a greater impact on shorter-term financing, such as construction loans. Today's VA rates are evidence that military borrowers have a real edge in the home finance market in 2013. The cut, the first since 2003, won't do much for those borrowers facing possible loss of their properties. Although adjustable rate mortgages may not go up as much as they would have otherwise, the difference won't be enough to help those in real trouble. Many borrowers are going to be stuck with their current loans because lenders have stopped taking risks. If they can't make higher monthly payments or convince their lenders to modify the terms of their mortgages, many sub-prime borrowers will go into default and foreclosure. While cuts in Federal Reserve System rates don't directly reduce VA mortgage rates, any rate cut is, ultimately, a good thing for veterans refinancing existing homes or applying for new VA mortgages. Because lenders know (or think they know) in advance when the Federal Reserve System will be cutting rates, lower VA mortgage rates are often available even before the Federal Reserve System announces a rate cut. The exact rate a veteran can expect to pay varies on a new or refinanced mortgage depends on whether he or she is buying or refinancing and upon how many points he or she is willing to pay. How does a VA mortgage with a fixed interest rate compare to an adjustable rate home loan? Use this calculator to compare the total interest paid over 15 and 30-year loans. Compare the monthly payments with the current VA mortgage rates. Learn more about how the VA mortgage can benefit your home buying process. Our team will help veterans become first time homebuyers. *The example quoted above is a 3.25% rate for a fixed 30-year on a $225,000 loan amount is $979.21 a month. There is $795 in closing cost on this sample. The Annual Percentage Rate is 3.39%. **The 2nd example is on the 2.75% quoted which was for a fixed 15-year VA rate on a $225,000 loan amount is $1,526.90 a month. There is $595 in closing cost on this sample. The Annual Percentage Rate is 2.86%. Please be aware that this is not an advertisement for credit as defined by paragraph 226.24 of regulation Z. Nothing on this site contains an offer to make a specific home loan for any purpose with any specific terms. BDNationwideMortgage.com does not have any affiliation with the VA or any other government entity. This is a web-site and no loans can be guaranteed as loans and rates are subject to change. BD Nationwide was affiliated with a federally chartered bank located in Maryland licensed to offer VA home loans in all 50 states. Copyright © 2001-2016 and Beyond, BDnationwidemortgage.com. All rights reserved. Do not duplicate in any form. Program guidelines and pricing is subject to change on VA mortgage rates.